In addition to Diogenes and Serapis, Sinop in Pontus was the home of several other well known people in early church history. Aquila. (Not the Aquila of Acts 18:2.) This Aquila, a native of Sinop in Pontus, is said to have been a relative of the Emperor Hadrian (A.D. 117-138). He was converted to Christianity during a visit to Jerusalem, but was rejected because he refused to give up his studies of astronomy. Later he became a proselyte to Judaism. Having become a disciple of the Rabbis, from whom he learned Hebrew and the rabbinical method of exegesis, he used his knowledge to make a revision of the Septuagint, bringing it into line with the official Hebrew text. It was soon adopted by Greek speaking Jews in preference to the LXX, which was used by the Christians. His translation, which was finished probably c. 140, was extremely literal, attempting to reproduce individual Hebrew words and phrases exactly. This procedure frequently obscured the sense; but the fidelity of Aquila’s version to the Hebrew original was admitted by the Fathers most competent to judge, such as Origen and Jerome. (Dictionary of the Christian Church, ed. Cross & Livingstone, 94). 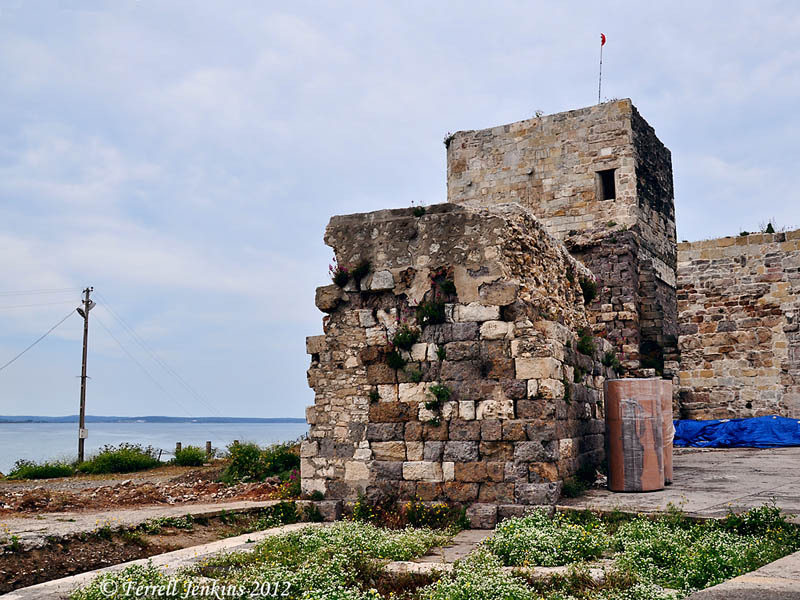 Tower and wall on the Black Sea at Sinop, Turkey. Photo by Ferrell Jenkins. Marcion (died c. 160 A.D.). We rarely read or hear the name Marcion without the word heretic attached to it. None of his writings have survived, but his success can be seen by the many early Fathers who spoke of him. (For a list of these see Bercot, ed., A Dictionary of Early Christian Beliefs.) This influential ship master of Pontus rejected the God of the Old Testament who he described as evil and vengeful. According to him, the Christian gospel was a message of love, and the Father of Jesus was not the God of the Old Testament. Many of his views were similar to those of Gnosticism. Marcion accepted only the Gospel of Luke among the Gospels, and the writings of Paul. Marcion went to Rome about A.D. 140, but within 4 years he was excommunicated from the church. From Rome he spread his teachings all over the Empire. Phocas (Phokas). Phocas was martyred at Sinop in A.D. 117 during the reign of the Roman Emperor Trajan. According to the Dictionary of the Christian Church (1282), a different man named Phocas “the Gardener” was martyred during the persecution by the Roman Emperor Diocletian in A.D. 303. I haven’t determined if he was associated with the port city of Sinop. Wilson seems to confuse these two persons (Biblical Turkey, 342). The Sinop Gospels is not a person, but should be mentioned in connection with the Black Sea port of Turkey. This parchment document was dyed purple and written in gold ink. The uncial manuscript 023 contains 43 pages of the gospel of Matthew. The manuscript was discovered in Sinop in the late 19th century is thought to have originated in Syria or Mesopotamia in the 6th century A.D. It is now in the Bibliothèque Nationale in Paris. A brief description in French, and a small image of two pages of the manuscript may be found here. The manuscript features small drawings to illustrate the biblical text. The displayed page shows Jesus healing a blind man. This entry was posted in Bible Study, Books, Church History, Culture, New Testament, Photography, Travel, Turkey and tagged Biblical Criticism, Roman Emperor, Roman Emperors, Roman Empire. Bookmark the permalink. Extremely amazing post. I was not aware about this destination. You have shared great information about Sinop and its famous Sinopeans. I would like to visit this place on my next trip. I really appreciate. Thanks for sharing informative post.